The southwestern states saw Native American tribes moving across the landscape for thousands of years. "Folsom Point" arrowheads have been dated as much as 13,000 years old and have been found from the Mississippi River valley on the east to the Sierra Nevadas on the west, from northern Mexico to Montana. That's evidence of a lot of travel and trade happening across a lot of countryside over thousands of years. But the pueblos couldn't exist until the nomads began to develop agriculture and that couldn't happen until water sources got more reliable. In the case of the often drought-stricken Four Corners area, that required long term periods with more moisture and less dry. Many of the ancient pueblo structures that have been excavated indicate they were built in times of adequate or above average rainfall. Some of them were occupied for hundreds of years, some for thirty years or less. Two elements they all had in common: underground religious structures and above-ground masonry structures. The underground religious structures most likely emerged because of the area-wide commonly held belief that "the people" emerged on this Earth through a hole in the ground, a sipapu. The Basketmakers lived in small huts above ground or in pithouses partially dug into the ground. 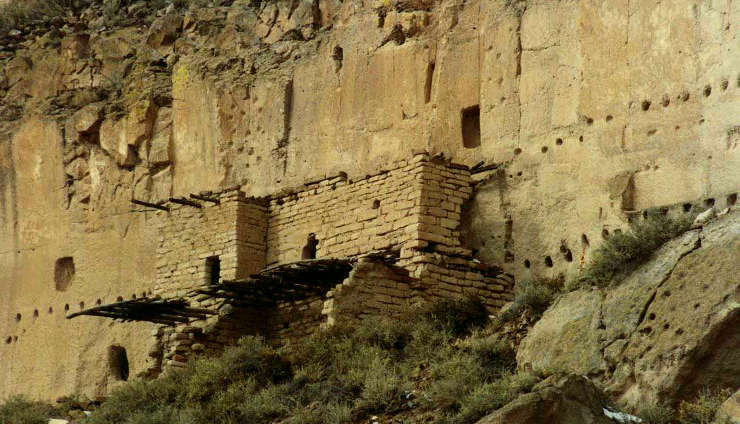 There is evidence that some pithouses evolved into kivas as residential complexes were built above ground. Two thousand years ago there were four major cultural groups in the southwestern states: the Mogollon, the Anasazi, the Hohokam and the Patayan. 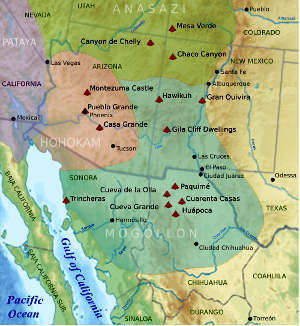 The Patayan mostly occupied southwestern Arizona (along the Colorado River) and southern California and Nevada. The Hohokam were dominant in south and central Arizona. 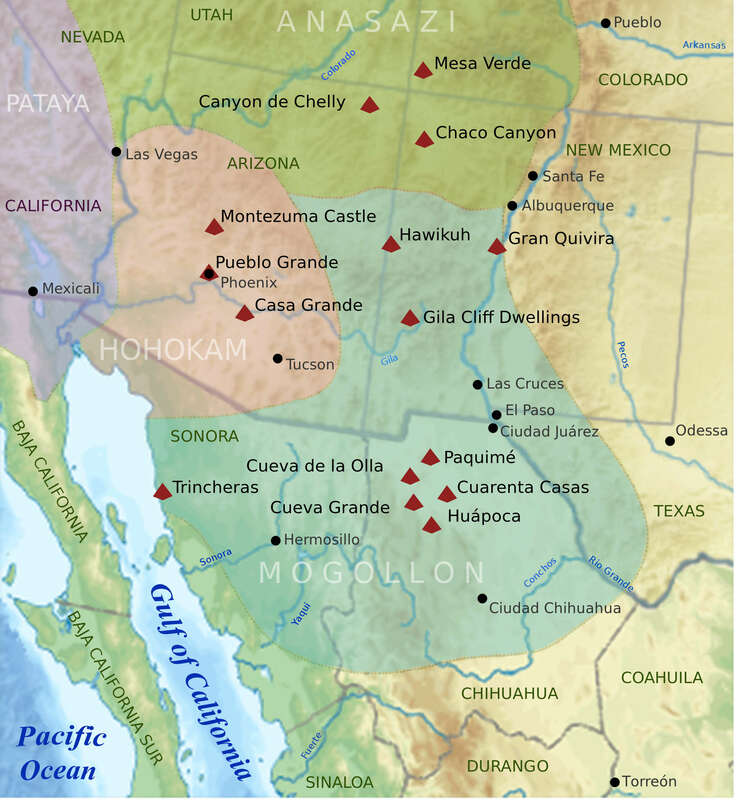 The Mogollon were in southwestern New Mexico, southeastern Arizona and northern Mexico. The Anasazi occupied northern Arizona, northwestern New Mexico, southwestern Colorado, southern Utah and southeastern Nevada. 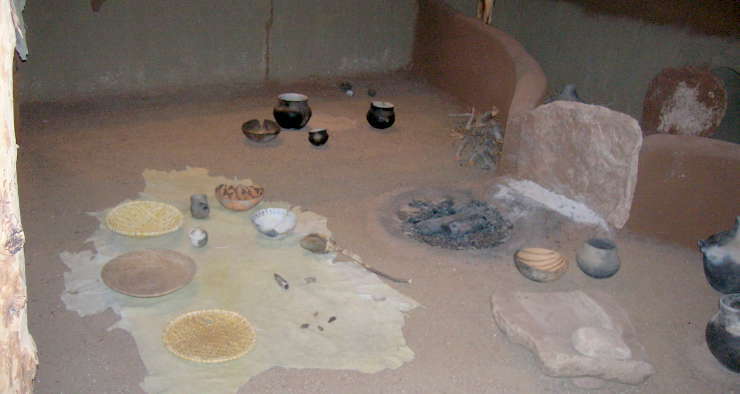 There were many cultural similarities between the Mogollon and the Anasazi, fewer similarities between them and the Hohokam and even fewer with the Patayan. Puebloan pottery is an art that has been honed over thousands of years. However, pottery is an indication of a relatively stable lifestyle as the nomadic lifestyle with its constant motion requires the use of less weighty and less fragile baskets as storage vessels. Pottery couldn't develop until the people settled down a bit and that couldn't happen in the arid region until the principles of irrigation were disseminated through the area: agriculture in the desert requires irrigation and irrigation requires a stable water source and people to develop the irrigation system. So the first bits of pottery the archaeologists have uncovered in the Southwest are associated with pithouses. The construction of pithouses indicates a society that is still semi-nomadic with an increasing use of agriculture. Over time, areas that grew more crops attracted more people, more people meant more workers for digging irrigation canals, more people required larger living structures... and the cycle repeated itself until any particular settlement (or group of settlements) came into trouble when the climate varied for any period of time. For the most part, daily-use pottery was functional in design and usually an unpainted gray in color. From about 500 to about 1300 CE, decorated pottery began to develop, usually using black painted designs on a white or gray background. Polychrome designs began around 1150 with the use of various mineral-based pigments. By the 1200's, bright colors grew more popular and in the 1300's highly developed motifs and designs were developed from Rio Salado in Arizona to the newly settled Rio Grande Pueblos in New Mexico. The design and style changes have been traced to significant social changes among the people and the geographical movement of the styles to the movement of people as their climate changed. The Salado people are classed as a subset of the Sinagua (meaning: without water) people who lived all across central and northern Arizona. The Sinagua are classed as a subset of the Anasazi (meaning: Ancestors of our enemies) whose present-day descendants are the Pueblo peoples of northern New Mexico and northeastern Arizona. And these days, the term "Anasazi" is in disfavor with "Ancestral Puebloan" becoming preferred. Pueblo I (750 to 900 CE) Pueblo buildings were constructed of stone with south-facing windows, and in U, E and L shapes. The buildings were located closer to each other, reflecting deepening religious celebration. Some kivas had towers built nearby, towers most likely used for look-outs. Pottery became used for more than just cooking, and included pitchers, ladles, bowls, jars and dishware for food and drink. White pottery with black designs first emerged in this time period, the pigments being developed from plants. Water conservation techniques and complex irrigation systems using reservoirs and silt-retaining dams also emerged during this period. Pueblo II (900-1150 CE) During the Pueblo II period the population increased so much that more than 10,000 sites were created in 150 years. Since most of the countryside was arid, the people supplemented their diet by foraging, hunting and trading pottery for food. 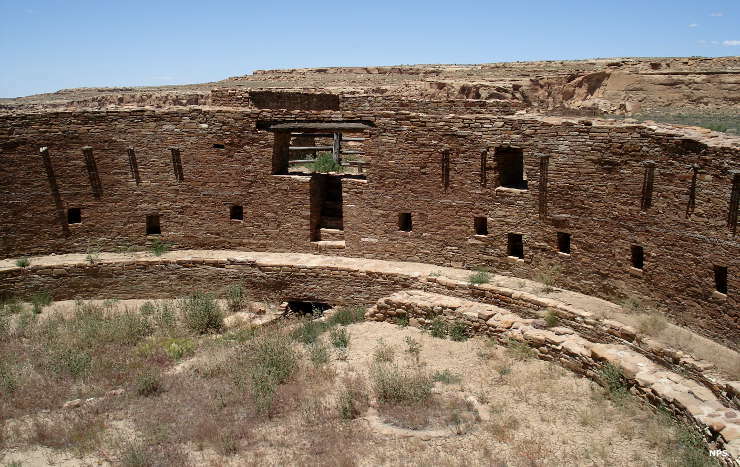 By the end of the Pueblo II period, there were many two-story dwellings made almost exclusively of stone masonry, the presence of towers and the development of family and community kivas. Pueblo III (1150-1300 CE) There was a significant community change during the Pueblo III period. Much of the population moved in from dispersed farmsteads to community centers at pueblos canyon heads or cliff dwellings on canyon shelves. Population peaked between 1200 to 1250 at more than 20,000 in the Mesa Verde region alone, far more than could be sustained for any length of time. By 1300 the Ancient Pueblo People abandoned most of their settlements as a result of climate changes and food shortage. Many of them migrated south and southeast to villages in Arizona and New Mexico. Many in New Mexico spent 50 or more years living on the Pajarito Plateau before migrating closer to the Rio Grande river bottom.